Abandoned Wrecks by Chris McNab. Amber Books Ltd, 2017. 9781782745204. 224pp. Gene: This is a book that [our friend] Dawn had at the last WASHYARG meeting, and I asked her not to tell you about it. I had to get it from the library system where you work because Seattle didn’t have a copy. G: Already, it’s the book for you. S: Half in, half out of the water. G: This is one of my favorites. It’s in Montenegro, it’s a small fishing boat that’s lost it’s entire back end. What’s that called? The stern? G: It’s a fishing boat wreck that’s been abandoned there on the shore. There are a few details about each one. Look at this. S: That’s great! Like a tall ship. G: It’s moving to look at — a tall sailboat with three masts on ice. It’s on Lake Ontario in Canada. S: From 1914. That’s later than I thought they would be building that kind of boat. G: This is a replica of a ship used by Jacques Cartier in the 16th century. This was repurposed — there was a restaurant on it at one point — but now it’s abandoned. It was even a Halloween party ship at one point. I’d have gone to one of those parties in a heartbeat. G: I bet there are still unsanctioned parties there. S: Get your tetanus shot and come to my party. G: These wrecks are reminders about how temporary we are — there are some bits about that in the book. What do you call them? Words. (flipping the page) But nothing is more of a reminder of how temporary we are than a ship in a desert. This is a rusted hulk in Uzbekistan where there used to be a sea. But thanks to the USSR rerouting some rivers, there’s no sea there now. How great is that? Like the worst 1/16th of an amazing photo from the book. 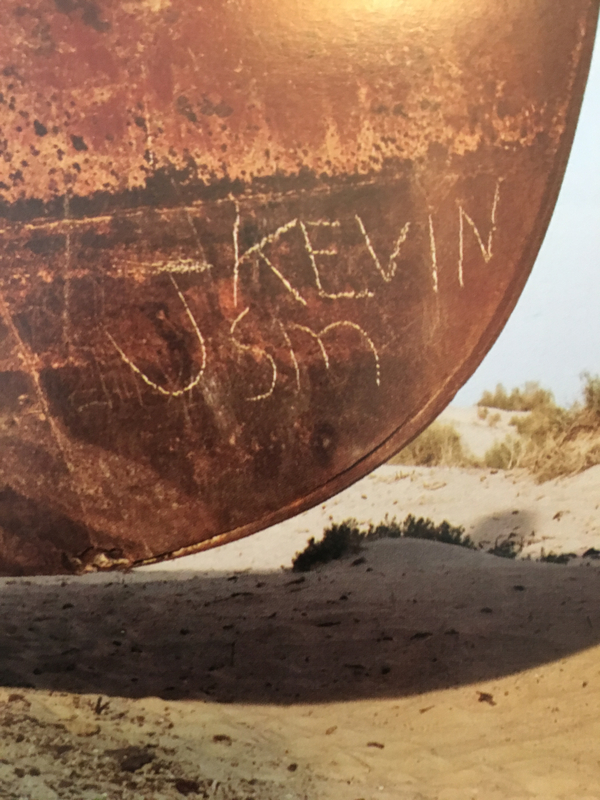 S: And some guy named Kevin went there and wrote his name on the hull. G: I don’t think that’s an Uzbek name. I hope that guy never sees this photo. And then it goes to trains. And I have to tell you, I don’t care about abandoned trains. I like old timey trains that move, but not these. S: They’re interesting, but they’re not a destination. G: I’ve seen so many trains just sitting next to highways my entire life, when we’ve driven east of the Cascade Mountains. S: We’re familiar with it. S: Looks like a tractor. G: It’s from the late 19th or early 20th century. That thing rode the rails! And it’s not really decaying. Then on to military vehicles — this is Kuwait in 1991, burned-out Iraqi military vehicles. And the next page are civilian vehicles on a different highway in Kuwait, same time frame, which I think is more striking because you saw the image on the previous page. Here’s a Russian tank buried in some rubble, in front of a building, in Syria. In case you don’t live in the Pacific Northwest and have never seen moss on a car. But this, four moss covered cars in a forest in Sweden, wow. Even in the Pacific Northwest I haven’t seen a lot of cars covered with moss. S: If you park too long, you’ll get some, but not covered. G: I see this and think, oh, yeah, we’re all doomed. And then my favorite section because of my fear of flying, Aircraft. A B-25 that looks very whole, that crashed in New Guinea. Military graveyards where they scrap old planes. An amazing crashed P-38 Lightning in Wales, half out of the water — the sand that’s burying the back end kind of looks like smoke coming out of the back. 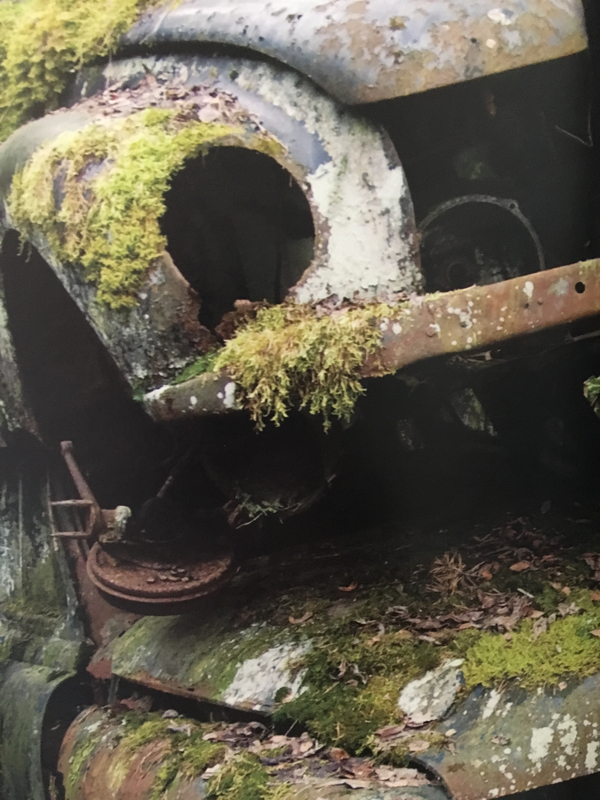 Then here’s the freakiest and closest to us, the engine of a B-26 bomber that crashed in British Columbia in 1950, a bit buried in the landscape. They had to jettison their nuclear bomb after three of the engines caught fire. February 13, 1950.